Peugeot e-Legend-Concept : the 504 Coupe of the future ? 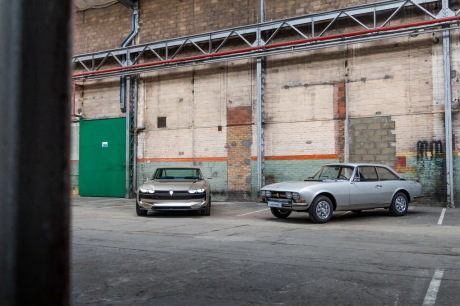 The Peugeot e-Legend Concept will be unveiled to the World of the Self, from 4 to 14 October 2018. Peugeot will not come with empty hands to the World of the Self. Indeed, at the sides of the 508 SW, which will make its first appearance in a motor show, a unique concept car will not fail to turn heads. The moment you discover this e-Legend-Concept, the relationship with an emblematic model of the brand sochalienne jumps to the eyes. This is the Peugeot 504 Coupe, which is marketed from 1969 to 1983. Designed by Pininfarina, it had a nice success, as approximately 23 000 copies have been produced. Since then, this model has become a classic in the field of vehicle collection. Director of style Peugeot, Gilles Vidal confirms this impression : “We don’t want the autonomous control to be synonymous with boredom, the aim was to make a concept car, dynamic, fun-to-drive and to look at. It has been tried in the history of the brand, a model who embodied particular pleasure and elegance “. This Peugeot e-Legend-Concept is surfing on the wave of neo-retro ? 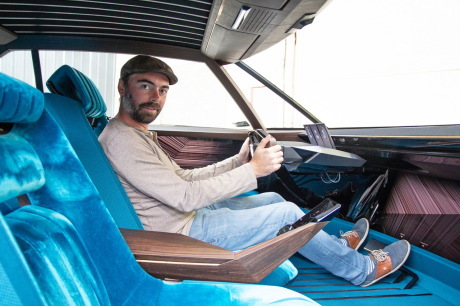 Gilles Vidal is defending : “If many elements evoke our coupe of the 70’s, this e-Legend-has-style effects, as the wheel arches, carved in the negative, the battery is apparent at the level of the underbody, or even the flanks with nice curves and a facet very clearly under the waistline “. The whole is managed with lines muscular while maintaining elegance. Its reasonable size also plays in its favor with a length of 4.65 m (10 cm less than a Peugeot 508), a width of 1.90 m and a height of 1.36 m. The 19 inch wheels are not in one-upmanship. After the opening of the electric door, you will discover a within high color. 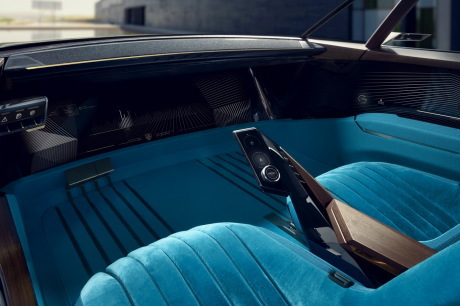 The blue chosen for the floor covering of mesh technique and the seats in silk velvet brings everything to the time of the tone and a touch vintage welcome. Ditto for the exotic wood that adorns the top of the doors, the central console or the dashboard. In fact, this last no longer exists since it was replaced by a sound bar. The instrument panel is reduced to three dials (recall the 504 Coupe) and a few keys “piano” located to the left of the driver. They allow in particular to control the opening of doors. Via controls located on the steering wheel or the touch screen placed at the end of the center console, it is possible to choose between two driving modes : Legend and Boost. The first is more focused on comfort, while the second wants to be immersive. The road is projected on a giant screen curved of 49 inches above the feet of the passengers, but also in the door through other screens 29 inches. Finally, two 12-inch displays are accommodated in the sun visor. 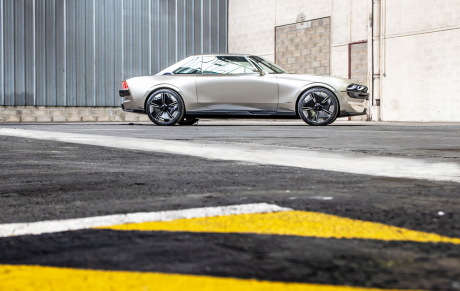 The Peugeot e-Legend is a concept 100 % electric. Located on the front and rear axles, its two motors are powered by a battery 100 kWh and they develop a cumulative power of 340 kW, or more than 460 hp. It is thus capable of going from 0 to 100 km/h in less than 4 s and reach 220 km/h top speed. Peugeot announces an autonomy of 600 km, according to the new registration WLTP. It can be recharged via an induction plate, but also with a rapid charge. In this case, 500 km of autonomy, are recoverable in just 25 minutes. By its proportions and its dimensions, this show-car is perfectly realistic. Its design, combining modernity and references to the past, is particularly successful. So, why not turn the trial ? Unfortunately, this e-Legend-will remain in the state. No body of this type or of the 508 Cut is not in the program. On the other hand, a concept never to be free, we will be able to find some style elements on the future products of the brand.